Occasionally, my cold critical perception is clouded by an overwhelming adoration for the subject matter. Not often, and it takes a lot to skew my perspective, but the Muppets are definitely one such influence. It takes a lot of focus and effort to overcome the nature ear-to-ear smile that marks my face as I'm sitting there, watching them sing and dance across the screen. But I do try, and walking out of Muppets Most Wanted, I pushed down deep the deafening cries of my inner voice belting out half remembered lines from the opening musical number, and had to think about what I'd just seen critically. It was a good film. Not perfect, and with more than enough room for improvement. But a good film none the less. Hit the jump for the review, which contains spoilers that have learned heartwarming lessons like sharing and taking your turn and the number 3. This is easily the most technically ambitious Muppet movie ever made, which is actually in keeping with Jim Henson's original motivations: there wasn't anything worth doing if it had already been done. The Muppet Movie had a full bodied Kermit riding a bike, so the Great Muppet Caper had the whole lot riding bikes. This film takes the honed puppetry arts and technology of modern film making to create the most seamless Muppet environment possible. Mostly, this translates to lots of full bodied Muppets. There are more legs seen here than in a burlesque show. Constantine, the villain of the piece, gets extensive full figure play. The range of motion of the puppets has also increased significantly, meaning that frogs can jump around the set, pigs can have a "puny god" moment (probably the best laugh in the film), and everyone else can seem more real than they ever have. The counter to that, is that this Muppet film contains more CGI than any other. Not the Muppets themselves, but the digital removal of the puppeteers, of the hand rods, some rejigging the environments to be more Muppet friendly. I have no problem with this, in theory. But because we live in an age where CGI is handed out unnecessarily in films, this also meant that the amount of conspicuous CGI was also at a maximum. And it was distracting as hell. The film looks it's best when it's relying on centuries old tradition of puppetry, not when it is using poorly rendered CG to "fill in" a scene (seriously, the final musical number looked incredibly cheap, as did the end credits sequence). As for the film itself, it's one of the most complete films the Muppets have ever been involved in. In that, it has an A-B-C plot that isn't dependent on the Muppets themselves, or on vignette style sequences, or depends on fourth wall breaking Muppet style segues into the next plot point. There are plenty of them, but they all comes secondary to a well developed A-plot that drives the entire film. It's the most cinematically mature the Muppets have been since Muppets From Space, but that's where comparisons with that film end. Picking up at the end of the last film, the Muppets go on a world tour at the suggestion of Dominic Badguy (Ricky Gervais). Dominic and his "superior" Constantine plan to steal the Crown Jewels of England, but first have to acquire a series of Macguffins hidden throughout Europe by Thomas Blood (who was a real guy, back in the 1600s). Constantine's resemblance to Kermit allows the criminal to swap places with the frog and use the Muppet's tour to provide cover for their crimes. The biggest problem with this set up is, Constantine and Dominic become the primary characters of the film. 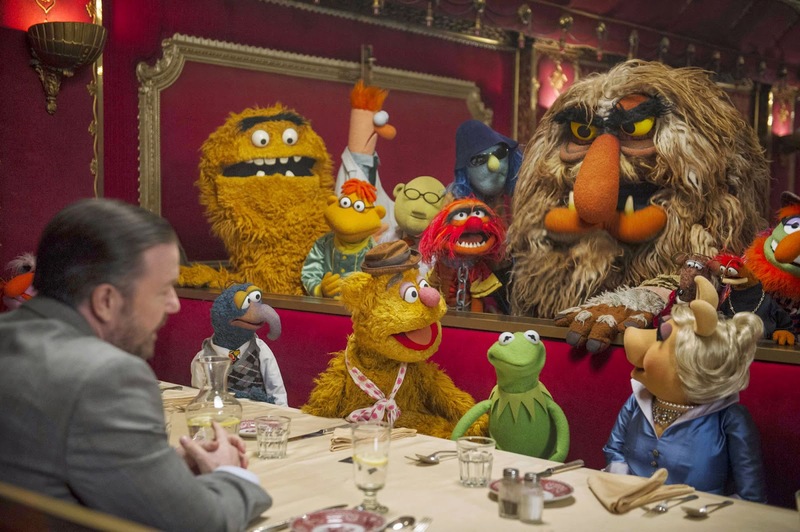 Kermit is hauled off to a gulag (more on that in a minute), and the rest of the Muppets are mostly reactive to Constantine's ruse until half way through, when Walter and Fozzie accidentally discover his secret. Making the villain the protagonist of the film, even accidentally, isn't the most inviting way to bring folks back into the Muppet fold. So, we spend most of the film with a Muppet we've never met before, whom we're meant to rooting against, as our guide through this adventure. The only reprieves are the far too few asides where we check in with Kermit in Siberia, or jump to Sam the Eagle, who is part of the police task force tracking the robberies. And Sam, for all his charm, is not a leading man. Where the plot falls over is in these asides, which cry out to be developed further. The gulag stuff is hard to watch, and should have been widdled down into a short sequence, or actually developed into a subplot with something to say. Because Kermit underwent such an emotional journey last time, the writers apparently felt like the status quo was good enough. The set up is, that Kermit is too demanding of the Muppets (hence their willingness to accept Constantine, who gives them whatever they want). But by film's end, Kermit doesn't learn to be more flexible, nor do the rest of the gang learn to be more reasonable. No one, including Walter, who should immediately be reduced to a background Muppet because his role as the Muppet Jiminy Cricket is grating here, is any different at the film's end than they are at the film's beginning, except maybe Piggy, but that probably won't take in the long run. When it was announced that the human cast of the film would be Ty Burrell, Ricky Gervais and Tina Fey, I never would have thought that I'd be coming out of the film thinking Fey was the weak link. Considering she spent seven years essentially playing Kermit in a human adaptation of the Muppet Show, you'd have thought she'd have been a natural fit, but her role never works. Part of it seems to Fey, who never seems at ease (she awkwardly an obviously moves back stage to make room for the puppeteer at one point) around the Muppets. And part of it is the role, which is underwritten. It is revealed that she has a Ms. Piggy level crush on Kermit, but that is never developed beyond being an annoyance. And like I mentioned before, the gulag material is the worst of the film, the jokes falling flatter than a bear posing as a bear skin rug. Burrell and Gervais on the other hand acquit themselves nicely. Both work well with their Muppet costars, and while neither should look for work in a Broadway musical anytime soon, they hold their own. I wish that Burrell and Sam's subplot had been developed more, their buddy cop routine a lot of fun in those instances when the writers remembered that they were part of the picture. If Disney is wise and green-lights another Muppet film in the near future, I think it's time for James Bobin and Bret Mckenzie to move on. While both of these last two films have been solid, this one shows signs of slippage, especially in the music. Muppet movies were known for creating iconic, character focused, emotional music. That isn't this. About the best song in this film (and there seems to be a lot more of them than usual) is the opening We're Doing A Sequel, but it's not a timeless piece. It's utterly dependent on being in this film. No song here transcends the narrative, to join the echelons of the classics. Which is probably why they insisted on revisiting another one of the classics for the finale, needlessly. It's this sort of the nostalgia that inhibits these films from fully becoming their own thing. That, and the songs here are used more as punctuation than as character exposition. They are fun, but they seem more at home in a Flight of the Concords episode than in a Muppet movie. None of them seem like Muppet songs (the worst offender is Constantine's seductive I'll Get You What You Want, which is great song and well executed, but is completely a Concords tune). All of that aside, this is a mostly solid piece of film, and the Muppets aren't playing second fiddle to a bunch of humans this time. The jokes are solid, and more this time aimed at the adult audience than the kids. It's a more grown up sort of film, as Caper was compared to Movie. Which, if the pattern holds, the next one should take inspiration from Manhattan, and that is easily the best of the bunch. Most wanted is far from the worst film the Muppet name has ever been attached to, but it's far from the best, and probably lacks a lot of repetitious viewing value. The one area it scores over any Muppet film since the original is the quantity and quality of the cameos. They are everywhere, and rarely drawn attention to, allowed to pop up, get our brains running the facial recognition software, and off they go. Recognizable faces abound, and unlike in the last film, not just TV famous. And, happily, not just these fifteen minutes famous. It's a wide margin of celebrities, and that's as much a part of Muppet tradition as anything else. A few words on the Monsters University short that preceded the picture: I didn't like it. It didn't fit in with the continuity of the core film, at least without a chaser that showed everyone hungover the next day, and unlike the highly successful Toy Story shorts, it didn't add anything meaningful to the overall franchise emotional arc. Plus, and worst of all, I didn't find it that funny.